Mmm… hot dogs. Who doesn’t like them?! These hot dogs are a perfect appetizer while watching the football game on Sunday or to take in a small crockpot to your next party. I always called them “special hot dogs” because I only associated them with three specific days a year when we would get them at home–Christmas Eve, New Year’s Eve and, of course, Superbowl Sunday (in fact, the recipe file on my computer is labeled “Special Bourbon Hot Dogs”). And what man doesn’t like bourbon whiskey?! So ladies, wow your guy by fixing him these to snack on (maybe you’ll get some extra brownie points)… or guys, these are simple to make and add to the crockpot for when your bromance is in full-gear during game time (you won’t be distracted with this snack like adding more chips to the bowl). Note: I doubled the recipe below when making for 6-8 people as a heavy appetizer. 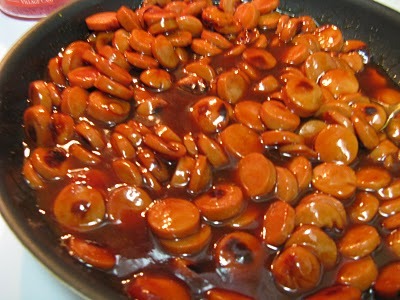 Cut hot dogs in circular pieces and place in a skillet on medium high heat. Cook until browned all over, about 15 minutes. Add brown sugar, ketchup and mustard. Mix well with the hot dogs, allowing the brown sugar to melt and create a thick sauce. Turn off heat and add bourbon whiskey (Note: I’ve even been known to double the bourbon to my taste… whoops!). Serve in a crockpot, in a heated fondue pot or in a warmed casserole dish.